An example of a successful breakout trade I flagged recently was industrial goods player American Superconductor (AMSC - Get Report), which I featured in July 11's "5 Stocks Ready for Breakouts" at around $1.65 per share. I mentioned in that piece that shares of American Superconductor were uptrending for the last two months and change, with shares moving higher from its low of $1.25 to its recent high of $1.78 a share. During that move, shares of AMSC had been consistently making higher lows and higher highs, which is bullish technical price action. That move was quickly pushing shares of AMSC within range of triggering a major breakout trade above its 200-day moving average of $1.70 to more resistance at $1.78 a share. Guess what happened? Shares American Superconductor started to trigger that breakout on July 14 and on July 16 this stock exploded sharply to the upside with monster upside volume. Volume on that day registered 11.45 million shares, which is well above its three-month average action 975,000 shares. Shares of AMSC tagged an intraday high of $2.10 a share on July 16, which represents a monster gain of close to 30% in just a few trading sessions. As you can see, trading breakouts that trigger with volume and produce fantastic returns very quickly. One banking player that's starting to trend within range of triggering a big breakout trade is Doral Financial (DRL, which provides retail banking services to general public and institutions. This stock has been hammered lower by the bears so far in 2014, with shares off sharply by 66%. If you take a look at the chart for Doral Financial, you'll notice that this stock has recently pulled back sharply from its high of $9.93 to its intraday low of $5.04 a share. During that drop, shares of DRL have been making mostly lower highs and lower lows, which is bearish technical price action. That said, shares of DRL are now starting to find some buying interest right around $5 a share. This could be setting up DRL for a sharp snapback rally if the stock can manage to break out above some key near-term overhead resistance levels. Traders should now look for long-biased trades in DRL if it manages to break out above some near-term overhead resistance levels at $5.52 to $6.16 a share with high volume. Look for a sustained move or close above those levels with volume that hits near or above its three-month average volume of 1.35 million shares. 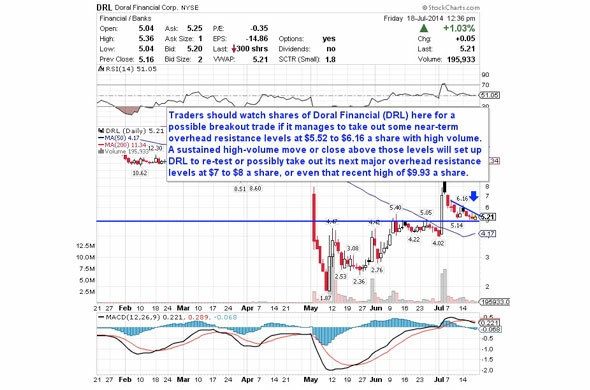 If that breakout hits soon, then DRL will set up to re-test or possibly take out its next major overhead resistance levels at $7 to $8 a share, or even that recent high of $9.93 a share. Traders can look to buy DRL off weakness to anticipate that breakout and simply use a stop that sits right below $5 a share. One can also buy DRL off strength once it starts to clear those breakout levels with volume and then simply use a stop that sits a comfortable percentage from your entry point. A independent oil and gas player that's starting to move within range of triggering a major breakout trade is ZaZa Energy (ZAZA, which focuses on the exploration and development of unconventional oil and gas assets in the U.S. This stock has been on a tear over the last three months, with shares up sharply by over 100%. If you take a look at the chart for ZaZa Energy, you'll notice that this stock has been consistently making higher lows over the last three months, which is bullish technical price action. This chart pattern has now created a strong floor of support for shares of ZAZA, since each time the stock pulls back buyers are scooping up shares at higher prices. Shares of ZAZA are now starting to spike higher right above some near-term support levels at 83 cents to 80 cents per share and it's quickly moving within range of triggering a major breakout trade. Traders should now look for long-biased trades in ZAZA if it manages to break out above its 200-day moving average at 90 cents per share and then once it takes out more key overhead resistance levels at 92 cents to 95 cents per share with high volume. Look for a sustained move or close above those levels with volume that hits near or above its three-month average action of 411,673 shares. If that breakout triggers soon, then ZAZA will set up to re-test or possibly take out its next major overhead resistance levels at $1.06 to $1.15, or even $1.25 to $1.40 a share. 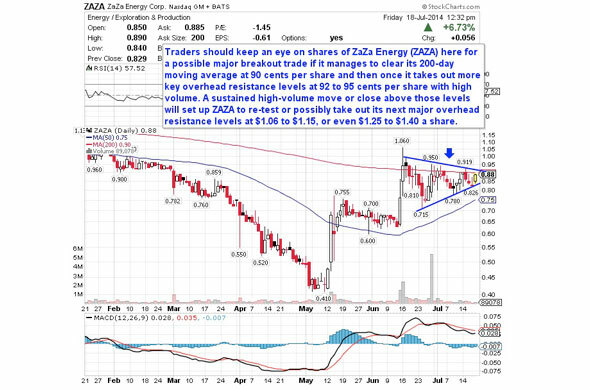 Traders can look to buy ZAZA off weakness to anticipate that breakout and simply use a stop that sits right below some near-term support levels at 83 to 78 cents per share or right around its 50-day moving average at 75 cents per share. One could also buy ZAZA off strength once it starts to take out those breakout levels with volume and then simply use a stop that sits a comfortable percentage from your entry point. 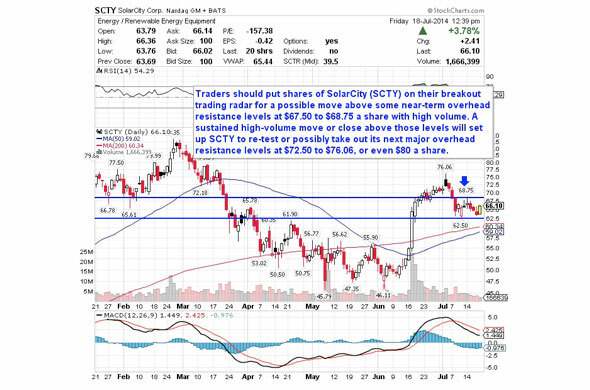 Another solar energy player that's starting to trend within range of triggering a near-term breakout trade is SolarCity (SCTY, which designs, installs and sells or leases solar energy systems to residential and commercial customers, and government entities in the U.S. This stock is off to a decent start in 2014, with shares higher by just over 16%. If you take a glance at the chart for SolarCity, you'll see that this stock is bouncing notably higher on Friday right above some near-term support at $62.50 a share. Shares of SCTY have now back-tested this key near-term support level after dropping from its recent high of $68.75 a share. This spike higher is now quickly pushing shares of SCTY within range of triggering a near-term breakout trade above some key overhead resistance levels. Traders should now look for long-biased trades in SCTY if it manages to break out above some near-term overhead resistance levels at $67.50 to $68.75 a share with high volume. Watch for a sustained move or close above those levels with volume that hits near or above its three-month average action 5.31 million shares. If that breakout kicks off soon, then SCTY will set up to re-test or possibly take out its next major overhead resistance levels at $72.50 to $76.06, or even $80 a share. Traders can look to buy SCTY off weakness to anticipate that breakout and simply use a stop that sits just below some key near-term support at $62.50 a share or near its 200-day moving average of $60.34 a share. One can also buy SCTY off strength once it starts to take out those breakout levels share with volume and then simply use a stop that sits a comfortable percentage from your entry point. Another technology player that's starting to move within range of triggering a big breakout trade is KEYW Holding (KEYW - Get Report), which provides mission-critical cybersecurity, cyber superiority, and geospatial intelligence solutions to the U.S. Government defense, intelligence, and national security agencies, and commercial enterprises. This stock has been hit hard by the sellers over the last six months, with shares off sharply by 26%. If you take a glance at the chart for KEYW Holding, you'll see that this stock has been uptrending over the last two months and change, with shares moving higher from its low of $9.71 to its recent high of $13.72 a share. During that uptrend, shares of KEYW have been consistently making higher lows and higher highs, which is bullish technical price action. That move has now pushed shares of KEYW within range of triggering a big breakout trade above some key near-term overhead resistance levels. 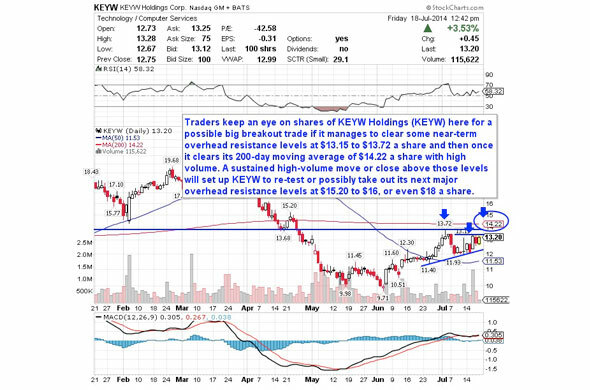 Traders should now look for long-biased trades in KEYW if it manages to break out above some near-term overhead resistance levels at $13.15 to $13.72 a share and then once it clears its 200-day moving average of $14.22 a share with high volume. Look for a sustained move or close above those levels with volume that registers near or above its three-month average volume of 532,126 shares. If that breakout gets underway soon, then KEYW will set up to re-test or possibly take out its next major overhead resistance levels at $15.20 to $16, or even $18 a share. Traders can look to buy KEYW off weakness to anticipate that breakout and simply use a stop that sits right below some key near-term support at $12 a share. One can also buy KEYW off strength once it starts to bust above those breakout levels with volume and then simply use a stop that sits a comfortable percentage from your entry point. My final breakout trading prospect is multimedia and graphics software player Zynga (ZNGA - Get Report), which develops, markets and operates online social games as live services played on the Internet, social networking sites, and mobile platforms in the U.S. and internationally. This stock is off sharply over the last three months, with shares down big by 28%. If you look at the chart for Zynga, you'll see that this has recently formed a double bottom chart pattern at $2.96 to $3.01 a share. Shares of ZNGA are now starting to bounce modestly higher here right off those support levels with heavy upside volume flows. That move is quickly pushing shares of ZNGA within range of triggering a major breakout trade above some key near-term overhead resistance levels. Traders should now look for long-biased trades in ZNGA if it manages to break out above its 50-day moving average of $3.23 a share to some more near-term overhead resistance levels at $3.27 to $3.29 a share with high volume. Look for a sustained move or close above those levels with volume that hits near or above its three-month average action of 25.64 million shares. If that breakout triggers soon, then ZNGA will set up to re-test or possibly take out its next major overhead resistance levels at $3.50 to $3.80, or even its 200-day moving average of $3.97 a share. Any high-volume moves above its 200-day will then give ZNGA a chance to tag its next major overhead resistance levels at $4.13 to $4.66 a share. 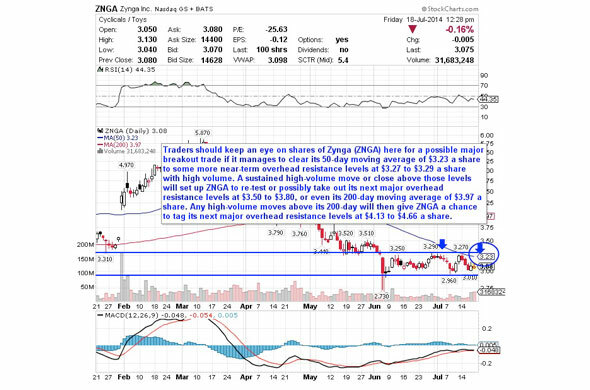 Traders can look to buy ZNGA off weakness to anticipate that breakout and simply use a stop that sits right below some key near-term support levels at $2.96 to $2.73 a share. One can also buy ZNGA off strength once it starts to clear those breakout levels with volume and then simply use a stop that sits a conformable percentage from your entry point.